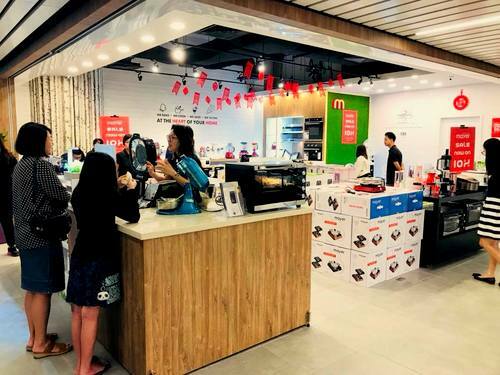 Home and kitchen appliances retailer Mayer Marketing has a network of five showroom stores in Singapore, one of which is within Aperia Mall (12 Kallang Avenue). Founded in 1987 and owned since 2012 by KHIND Holding Berhad, Mayer Marketing is today one of the leading distributors of quality home and kitchen appliances in Singapore. In addition to their in-house brands, Mayer and Mistral, the company also retails additional third party brands such as Aqua Optima, Candy, Coway, Click & Grow, Honeywell, KitchenAid, and Naturai. The unifying philosophy behind the brands and products is that they are stylish, reliable, durable, and reasonably priced for the discerning Singaporean customer. …home appliances (air purifiers, air conditioners / coolers, dryers, shower heaters, fans, garment steamers, vacuums, washers, wine chillers), and smart garden products. The official Mayer Marketing Singapore Facebook page is located at www.facebook.com/mayerspore/. You can also follow the official Mayer Singapore Instagram account, which in turn is available at www.instagram.com/mayerspore/.